Then you’ll love Umbrella Brewing Ginger Beer. Then look no further as this brewers is so unique and based in actual London. 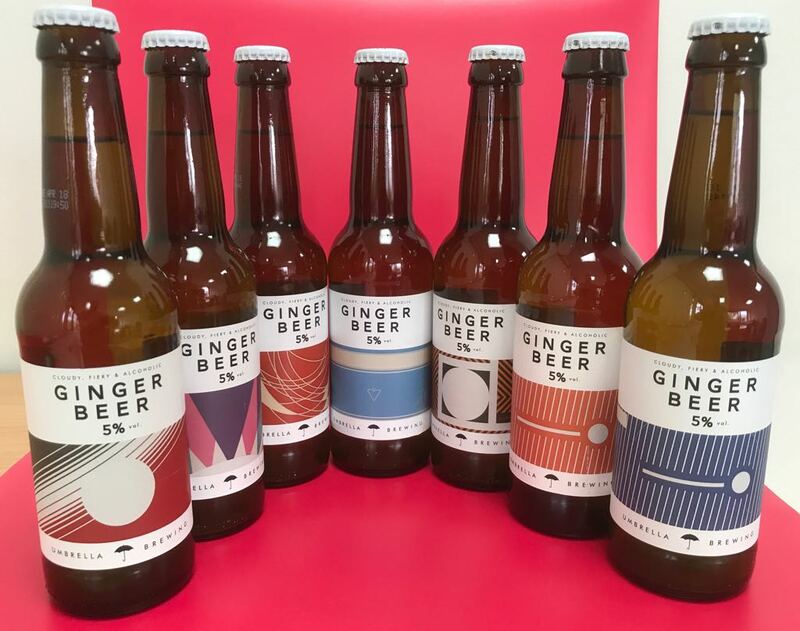 It is their mission to create the best alcoholic ginger beer on the market. They supply Ginger Beer which is cloudy, fiery and alcoholic. Their ginger beer is made out fresh pressed ginger with a balance of sharp lemon citrus, demerara sugar and a subtle hint of malt. It is then gently carbonated. As their beers are made out of natural ingredients it creates natural sediment in every bottle. This sediment is the root of the unique fiery flavour that it gives. In order to properly enjoy the Ginger Beer it is always recommend that you gently turn the bottle over before drinking it plus it’s best served chilled. Some members of Love Pop Ups London community where lucky enough to try some Ginger Beer from their first batch early 2017. Read their reviews from the comments below. Early in 2018 some members of Love Pop Ups London community had the opportunity to have a unique tour around their brewery and taste some of their new improved Ginger Beer. Click here to be redirected to read their blogs, reviews and / or vlog about the tour. Click here to find out further about Umbrella Brewing. This was my first taste of Umbrella Brewing’s alcoholic ginger beer and I must admit I was pleasantly surprised especially considering it was my first alcoholic ginger beer. It is a cloudy drink, pale in colour and has a strong ginger aroma. It gives you a warm feeling within your mouth whilst it flows over your tongue down your throat hitting your stomach this is all caused by the strong ginger flavour which is fiery and spicy in taste. This is what makes it so appealing to any ginger beer lover. I personally would not be able to drink a whole bottle as it is strong but it is ever so tasty. I would highly recommend if drinking in summer then to serve it chilled and if in winter have it as it is. Don’t forget to though turn the bottle upside down a few times to merge the ginger and liquid together as this is made out of natural ingredients after all. So if you come across this at any festival or independent sellers I highly recommend any ginger beer lover to buy this drink. I have always really enjoyed ginger beer and this one was great! It was spicy, but not hot while being the right amount of sweet. It’s more ginger than beer which I really like as well. I could and did drink a whole bottle, and would drink many more. I need to have another, with a big glass of ice while sitting in a park! Umbrella Brewing Ginger Beer. This is only the second alcoholic ginger beer I’ve ever tried after Crabbies. Crabbies, as far as I can tell, is aimed at drinkers of the more commercial ciders such as Bulmers and Koperbergs. Umbrella Brewing seem to be trying to find a different audience. On the bottle they say it is “cloudy, fiery and alcoholic” and the happily hit all of those posts. It’s a really earthy, spicy ginger beer which has a surprisingly sweet nose, like stem ginger. This sweet nose quickly gives way to fiery intensity which I found rather pleasing. I’ll keep my eye out for this one in the shops! If you want your evening livening up, you need to get a bottle of umbrella brewing ginger beer and it will kick start you to great places. The intense ginger flavour, which is natural and cloudy will be a delight for all ginger beer lovers. Being an avid fan of ginger beer I was excited to try the alcoholic version. Umbrella Brewing has a great label and cap, making it appealing to look at. Be sue to shake as the label says to mix the sediment. Serve cold. Fiery taste. I’m a fan of normal non-alcoholic Ginger beer and wanted to see how an alcoholic version would be like. The drink description says “cloudy, fiery and alcoholic” and it is definitely that. It’s a good but strong spicy ginger beer which lingers on your tongue. I wouldn’t be able to drink the whole bottle so poured it out on a glass to share with friends and had good comments all around. It would be good value for money and a posher alternative to normal beer.